CX Journey™: Is Your Customer Experience Something You’ve Experienced (as a Customer)? Is Your Customer Experience Something You’ve Experienced (as a Customer)? If you haven’t yourself experienced the customer experience at your business, is it really wise to invite an unsuspecting public in? Can you assume, with any confidence, that they will enjoy something you’ve never tried yourself? I’m always startled when businesses don’t work at finding out, firsthand, what it’s like to use their own service or product. Of course, it’s easy to fail to use your own product or service: Separate employee entrance; separate employee parking; separate, streamlined login process on your website; separate everything. Drive home at night, wash your hands, put work behind you. Until the next morning. The photo below (from an otherwise very serviceable hotel, FWIW), shows the hazards of such oversights, in a very minor, non-life-threatening way. Let me explain. 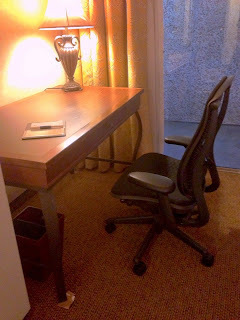 High and precariously leveled hotel desk, low desk chair. As a guest hoping to work from my hotel room, I’ve hand-cranked the desk chair — which is a nice chair, thoughtfully provided by the hotel, if not actually a Miller Freeman Aeron chair, at least a serviceable “Ikea Freeman” knockoff — to literally its highest possible level. Yet even so, I am being asked by the combination of lowish seat and highish desk to type with my elbows. Which is the kind of acrobatic maneuver I’m not at all deft at. As a guest hoping to work from my hotel room, I’ve hand-cranked the desk chair - which is a nice chair, thoughtfully provided by the hotel, if not actually a Miller Freeman Aeron chair, at least a serviceable “Ikea Freeman” knockoff - to literally its highest possible level. Yet even so, I am being asked by the combination of lowish seat and highish desk to type with my elbows. Which is the kind of acrobatic maneuver I’m not at all deft at. Both of these mismatches - table height to maximum chair height, desk instability to needs of guests, such as typing without spilling their water - would have been obvious if someone on the hotel team had tried, even once, to use the desk. This, I argue, would beat hearing about it on TripAdvisor, wouldn’t it? Or more likely, never hearing about it. A fate that is probably even worse. 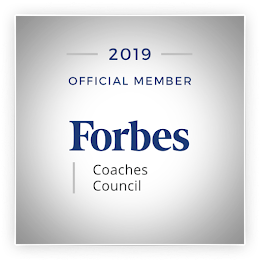 When I consult for a business on customer service and the customer experience, one of the first steps I take is to secret-shop the establishment. I’m pretty obsessive: A typical secret shopping report for, say, an excellent restaurant that wants to improve further, is some 35 pages of photos and text. Such a report may seem excessive, and perhaps it is. But you should be trying at least a scaled-down version of shopping yourself, yourself. As often as possible. PS: To correct a misconception I’ve seen elsewhere: No, you don’t need everyone who works for you to necessarily be the target customer of your business. This is a misconception in the other direction, and obviously unworkable in many situations. For example: While the five-star Four Seasons Hotels and Resorts company does permit employees to stay free–at any of their resorts, occupancy permitting (a policy which is brilliant for obvious reasons, including employee retention), this doesn’t mean that Four Seasons expects their employees to entirely channel the reality of their Bentley-driving median customer. Likewise, you don’t have to be a skate punk to sell skateboard gear. And so forth. But you do need to have your eyes open. Is Your Customer Experience a Trade Secret? Nostalgia: Creating Memories or Making Noise?